A surplus store in Oceanside is donating dress blues to a family in need after the death of a Marine. NBC 7's Megan Tevrizian reports. After receiving a phone call last week, a local store jumped into action to help a Florida family desperate to find dress blues to bury their fallen Marine in. A customer reached out to Gearhound Surplus, a military surplus and used uniform store, on Thursday saying the family of a Marine he’d served with needed dress blues to bury him in. Joseph Foster, the store's owner and a Marine veteran, immediately knew the store needed to help. 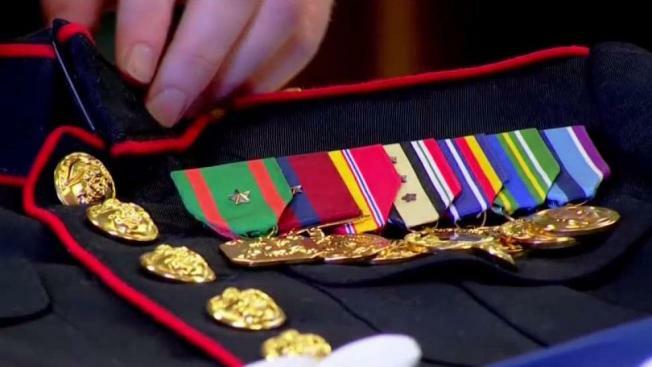 "We stopped everything we were doing here, grabbed all the uniforms, mounted the ribbons for them and sent it straight over to the post office overnight, and it arrived about two hours ago so the Marine will be buried in his uniform on Tuesday," Foster told NBC 7. The funeral is Tuesday morning and the family needed the uniform right away, Foster said. "The family was just ecstatic that it arrived on time and that they’re going to honor the Marine how he wanted to be honored." The Marine's step-sister called the store back asking how much she owed. Foster told her, "no, we’re not taking money from you." He told NBC 7 it’s just one small thing they can do to honor fallen Marines. "I can’t charge anyone," Foster said. "It’s just a little something we do to give back to the military community because if it wasn’t for them we wouldn’t have our business and the country that we live in." Foster is a retired Marine veteran who was injured by an enemy sniper in Iraq in 2010. He opened Gearhound in 2014, and he said they have provided about 50 uniforms for fallen Marines. He said if the family had to buy a full used dress uniform themselves it could run up to $800. "I’ve had customers write letters, send me videos, come in the store, travel all the way to California to give me a thank you," he said. "Some of them will donate a little bit of cash. That way we can help the next one." Some people also donate old uniforms. The Marine Foster helped this weekend committed suicide, which hit home for him because one of his cousins who was a Marine, killed himself when Foster was still in high school. "I’ve always remembered him and I remember the heartache that it caused for our family, and unfortunately it’s an epidemic that is going through every branch of the military," he said. He wishes he could save the Marines from killing themselves, of course, "but this is just one last little piece that we can do to honor them," he explained. "When the Marines look into the casket they don’t see the troubles that they had, they don’t blame them for what they did, they see them as the Marine that they knew, that they were so proud of and that’s the image we want the family to see. "We want them to be proud of their Marine, no matter what happened and how their life ended. That’s the biggest honor for us." He said he does whatever he can to help fellow Marines who come into the shop, including referring them to one of the nonprofits they work with if they need to talk to someone. "Marines take care of one another." If you or someone you know is feeling depressed or suicidal please call the National Suicide Prevention Lifeline at 1-800-273-8255 (TALK). The lifeline provides 24/7, free and confidential support for people in distress as well as prevention and crisis resources for you or your loved ones.